All of us have defining moments in our lives that mark our entrance into adulthood. So it was for our country. Although we may be celebrating the 150th birthday of our nation, it was a century ago that Canada came of age by coming out of the shadow of Great Britain and establishing its own identity. It was a turning point for our country that would forever change the way we felt about ourselves and the way the rest of the world viewed us. Early Easter Monday, April 9, 1917, Canadian troops would begin the siege to secure Vimy Ridge in northern France. The ridge was a seven-mile long escarpment, strategically located, and occupied by Germany. From the beginning of the First World War the Germans had taken the ridge and defended it. They had strongly fortified the site with artillery, tunnels and communication lines, so that it appeared to be impregnable. Attempts by the British and the French to take the ridge had all failed. Then the Canadians were tasked with the daunting job of giving it their best shot. This would be the first time that all four Canadian divisions would work together as one unit. Military commanders decided to approach the upcoming attack differently. They took weeks to plan and rehearse their movements. Models were constructed to review manoeuvres and aerial photographs were studied to learn the terrain they would be covering. The infantry was designated with specialized roles such as machine-gunners, rifle-men and grenade-throwers. Then leading up to the attack, British and French forces kept the German troops that held the ridge under constant barrage. According to plan, the Canadians came out of the trenches, dugouts and tunnels to storm the slope. They surged over badly broken ground and kept pressing forward. They forced the Germans to remain in their dugouts and away from the deadly machine-guns. Even so, scores of Canadians fell in their attempt to get to the top. Many acts of individual heroism were recorded that day. Finally after four days on intense fighting the Canucks secured Hill 145, the highest point and the heart of the ridge. 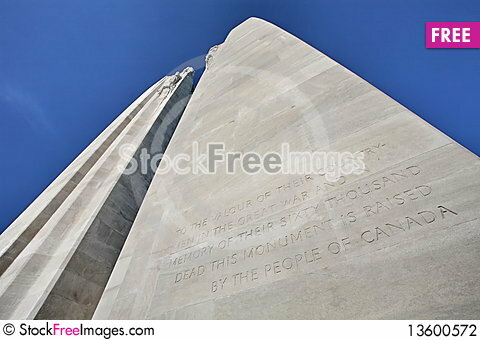 Today the Vimy monument stands on this site to commemorate that vital victory. That site, along with some land surrounding it, was ceded to Canada by France for perpetuity. The battle of Vimy Ridge was a stunning success, but it came at a terrible cost—3,598 men were killed and 7,000 were wounded. It stood as a testament to the fortitude, moral fibre and determination of our young country. Canada did come of age in April of 1917, but it took blood, sweat and tears to do so.